Debited directly from your checking account. Accepted where major credit cards are accepted. Withdraw available cash from your checking or savings at an ATM terminal. Free ATM access at any Farmers Bank of Lohman ATM. Cards have EMV Chip for extra security. For more information on EMV, see below. To report a lost or stolen ATM/Debit card during banking hours Monday-Friday between the hours of 7:30 a.m.-4:00 p.m. please call 573 893-5665. After banking hours please call 800 472-3272. Are you planning a trip or making an internet purchase overseas? Foreign countries are currently blocked for your fraud protection. Notify Farmers Bank of your travel plans or foreign purchases to ensure continued access to your funds. Contact your local branch office at 573 893-5665 or 573 782-4431. What is “chip” or “EMV” card technology? 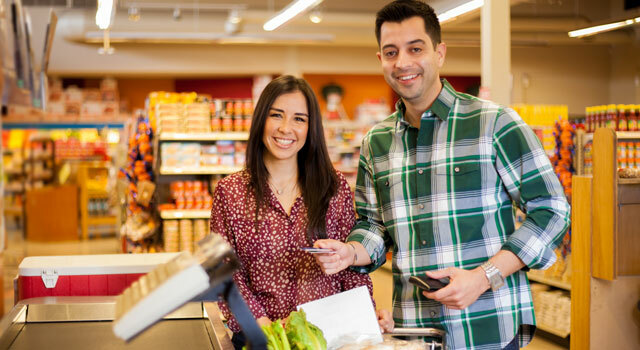 “EMV” or “chip” cards are embedded with a computer chip that replaces the magnetic stripe for in-store transactions. It’s all about security -- the chips are almost impossible to copy or counterfeit. EMV stands for “Europay, MasterCard, Visa,” which were the original chip developers. How do EMV chips protect my data? Counterfeit card fraud occurs when a magnetic stripe card is copied (or created using information stolen in a data breach) and then used in a store by a criminal. Chip cards prevent this kind of fraud, because the chips can’t be programmed with copied or stolen account information. The chip produces a one-time transaction code that can’t be guessed or re-used for future transactions, adding a dynamic, ever changing layer of security on top of static card information like account numbers. When will I get my EMV card? EMV cards will be issued once magnetic stripe cards expire. If you would like an EMV card before your card expires, please contact us. Will my old card still work? Yes, if you don’t have a chip card yet, you will still be able to swipe your card’s magnetic stripe, just like you’ve done for years. The EMV terminals that have been installed so far here in the U.S. also accept payments from magnetic stripe cards. Just like magnetic stripe cards, EMV cards are processed for payment in two steps: card reading and transaction verification. Instead of swiping your card to pay, you stick it in a slot on the terminal and leave it there while the transaction processes. If it seems like it takes a few extra seconds to make a transaction, it’s because there are advanced security processes going on behind the scenes. If I want to use my chip-card at a retailer that doesn't support EMV technology yet, will it work? Yes. Our EMV cards will be equipped with both chip and magnetic-stripe functions so consumer spending is not disrupted and merchants can adjust.